iTunes has reached another landmark - 25 billion songs have been bought through the service, according to Apple. On average, it's selling more than 15,000 songs a minute, Apple's latest stats say. The lucky fellow who downloaded the 25 billionth tune was awarded a 10,000 euro iTunes Gift Card as a reward. That man was Philip Lupke from Germany, and the milestone song was Monkey Drums (Goksel Vancin Remix) by Chase Buch. Us neither. 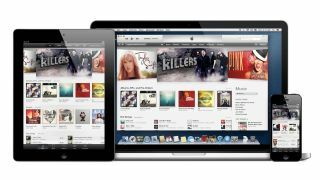 iTunes now has a catalogue of more than 26 million songs and is available in 119 countries, since it expanded at the end of last year. Just before Christmas, the service rolled out to another 56 nations. iTunes 11 launched just a few days earlier. iTunes Match, Apple's cloud music storage service, is available in all countries where you can get the music software. And all this despite iTunes' much criticised clunky, non-intuitive interface and processor-sapping performance.